Julianne is a good witch, living in the magical forest of Ennyar with her cat, Magicus. She can communicate with the creatures of the forest, and she lives a simple and peaceful life. But one day the king sends his knight to see her about a journey through Ennyar, and Julianne discovers an unusual egg on her way back home. This egg is important to the forest, and Julianne is entrusted with its care. But how can she complete her mission on her own? She will need to enlist the magical beings of the forest to help her. 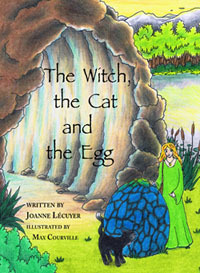 The Witch, the Cat and the Egg is a gentle tale of a sweet girl and her friends who always want to do the right thing. The forest is a magical and safe place, and no danger ever lurks. But a dilemma, other than the care of the egg, might have added a deeper dimension to this story, creating some tension and drama. Overall, though, this story portrays really good and caring characters, and leaves the reader feeling that magic is possible in her own life.